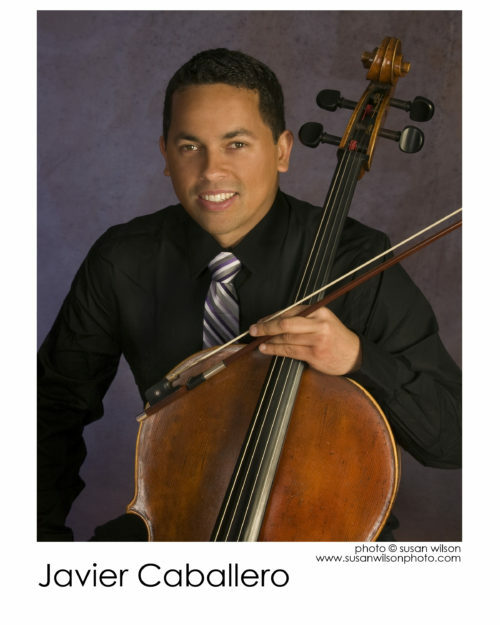 Born in Puerto Rico, cellist Javier Caballero is a versatile performer, educator, and arts administrator based in Boston. His principal teachers include Rhonda Rider and Scott Kluksdahl. Equally at home performing chamber music with Shelter Music Boston, contemporary works with Castle of Our Skins, musical theater shows at SpeakEasy Stage Company, and string quartets on white water rafting tours with Dvorak Expeditions, Mr. Caballero has also recorded several albums with Middle Eastern, New Age, Balkan and Indie Rock groups and has been featured on PBS and QVC. Performance tours have taken him to China, as well as Palestine and Israel as part of the Al Kamandjati Music School. As an educator, Mr. Caballero maintains a private studio and has previously served on the faculties of the Brookline and Watertown public schools, as well as the Point Counterpoint, Apple Hill, and Junior Strings Intensive (Tanglewood) summer music festivals. He is the former Artistic Director of Project STEP at Symphony Hall and currently serves as the Scholarship & Recruitment Manager at From the Top— the hit NPR show that celebrates the stories, talents, and character of the best young classically-trained musicians in the country. BM University of South Florida; MM, GPD Boston Conservatory.